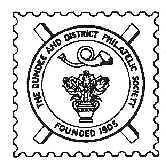 This web page contains the facility to search the Dundee & District Philatelic Society Library. Currently the Society Library contains 425 publications. Copyright (c) 2016 Dundee & District Philatelic Society. This page was last modified on 17th May 2018.